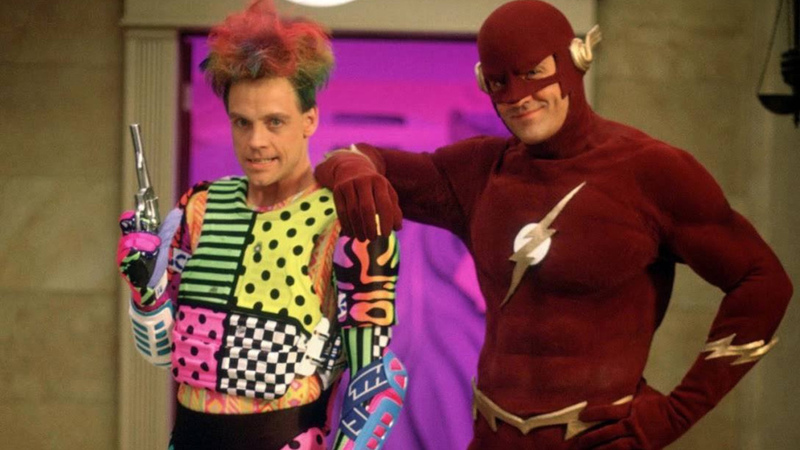 Fresh off of watching Mark Hamill’s portrayal of “The Trickster” on CW’s “The Flash” (that’s a lot of quotes), I had to wonder.. could he actually exist in todays world? The Flash is not going to be that hard to work with, since this is strictly a relativity thing, so straight physics here. We’re going to focus on one iteration of The Flash, specifically the one centred around CW’s television series The Flash, which is centred around Barry Allen. For those who are wondering, Barry Allen is 183 centimetres tall, and weighs 88 kilograms. In most situations, we’re going to ignore “Speed Force”, which is an invention by DC to allow Barry to break the laws of physics whenever he, or any potential ‘speedster’ wanted too. Could something move as fast as Barry Allen does? Google says to walk this, would take me 13 minutes, at 5 kilometres an hour. Let’s amp that speed up to 1000 km/hr, and it brings us to 3.9 seconds. Roughly the same speed that Barry cleared the entire district in, but our speed only reflects doing a lap. Already we know that a human couldn’t survive that speed as flesh would be torn from bone at that speed. Good thing there’s a hospital close by. Toronto General Hospital’s website states that there’s 471 beds at the hospital, two per room on average, so we can assume there’s 235 rooms for patients. There’s 238000 square feet of research space, and since the rooms vary in size, let’s assume that there’s 400,000 square feet total of space for the entire building. The picture above shows us that TGH takes up roughly 40% of the area, so let’s multiply that by 2.5 to give us 1,000,000 square feet total volume, all floors and buildings in the above square. A few calculations has given me that that is 92903 square metres, so Barry would need to be running at 30967.67 kilometres an hour. At that speed, Barry would be travelling at 0.77 Earth’s escape velocity, or just a hair over 25 times the speed of sound. Barry Allen is dead.. twice.. Assume that the above is still possible; what about his caloric intake? This is going to cover a few different areas. First, how many calories did he burn during that little stunt mentioned above, and, how many calories would Barry need to consume in order to do that and live with basic human functionality. We know that an adult male requires 1 650 calories a day for basic human function and life. This doesn’t include additional calories required if he goes to the gym, or what not, so let’s round that up to 2 300 calories, and assume that Barry goes to the gym for 2 hours a day. He does look pretty shredded after all, bro. I need to make one thing clear though: I’m not a health expert, and I very much am in agreement that things like caloric burn rate and what not is a very finicky thing to get accurate. We’re going to assume linear scales here, and work just with the numbers. Hitting up this website shows me that a 210 pound runner will burn just under 3600 calories while running a marathon, and the average runner finishes with just under 4.5 hours time, which is a pace of 6:23 a kilometre. Doing some simple math shows us that that’s roughly 1 calorie per 4 seconds. Barry Allen would need to consume 128 100 557 calories just to do that stunt above, and still survive with 2300 calories remaining. Barry Allen would need to eat 76 251 McDonald’s Chicken McNuggets, or 185 653 Double Big Mac Sandwiches. Barry Allen is dead.. again..